It's August, half way through summer vacation, and if you're like me, you're probably filled with a few conflicting emotions. Some days I feel a bit of relief that there's only a month left until the kids go back to school. Most days though, there's a disappointment and regret that summer is already half over, and that the kids will be going back to school so soon. I've made my Gotta do THIS August list around the feeling of wanting to accomplish as many awesome things as possible in the remaining month of summer vacation. There's One Month Left of Summer Vacation. Make August Count ! What's left on your summer fun list? What do you really want to do with the kids before they go back to school? What's left on your summer fun list? I have this crazy goal of doing at least one thing each month that scares me. In the last few months my son and I have tried a flying trapeze, we've visited an aerial park, and I climbed a mountain on a via ferrata route. We've climbed mountains that kicked our butts, I tried rock climbing (after taking an 8+ year break,) and my son just tackled two new mountain bike trails at Winsport's Canada Olympic Park. Climb a mountain! Ha Ling Peak in Canmore is a classic "first family scramble" Read about the Ha Ling Peak Hike here. Hike into a backcountry hut. This is easy backpacking because you don't have to bring a tent, cooking gear, or mattresses. Just bring a sleeping bag, clothes, food and basic overnight gear. Read about our hike into the Elk Lakes Cabin here. Try rock climbing as a family. And if you don't have anybody to take you climbing outdoors, try some fun indoor climbing at the Hanger in Calgary. Read about our adventures at the Calgary Climb Park here. Visit a mountain bike park with the kids. The bike park in Fish Creek Provincial Park is super fun and is a great place to work on beginner mountain bike skills. Find a giant list of bike parks and pump tracks across Alberta and BC here. Need to make your first mountain ascent a little bit easier? Try the mighty Tunnel Mountain in Banff. This is a great first summit for kids as young as 3-4 years olds. You can also try a lift-accessed summit. The Banff Gondola, Jasper Tramway, and the gondola at Kicking Horse Mountain Resort in Golden all give access to easy summits you can tackle with young kids. You can find a list of most of our family's "first summits" at the end of my recent story on hiking up Heart Mountain. 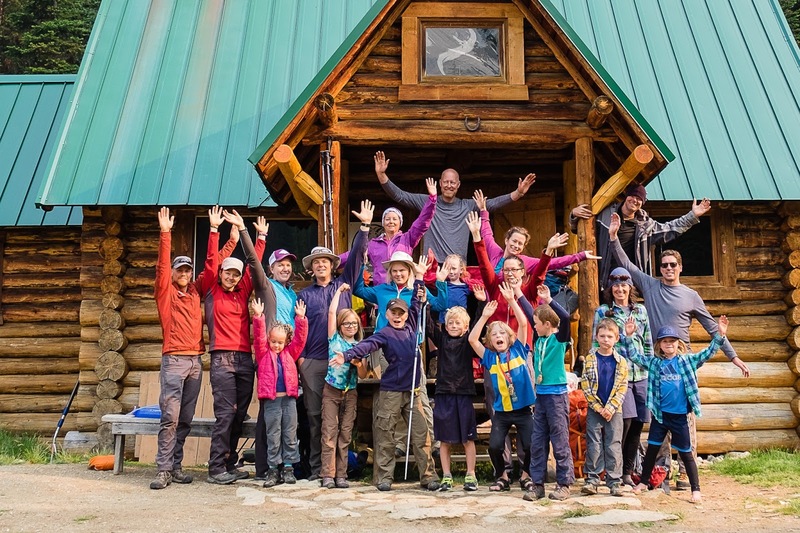 For a challenge with older kids or teens, you can read about our newest summits here: The Little Lougheed Summit or The Grizzly Peak Summit. Two. Do Something that Screams "Classic Summer Fun"
It's important to have classic "summer play days" amidst all the adventures. After all, these are "kids" we're talking about. They don't want to be out climbing mountains, backpacking, or mountain biking every day. And when it's 30 degrees out, you have to drop everything for a beach day. Do something that screams "classic summer fun"
Float a river! We loved river floating in Red Lodge Provincial Park and in Writing on Stone Provincial Park this summer. Read more about river floating in this recent story I wrote. Visit a skateboard park. My son LOVES these things and likes to use his bike at them. Fortunately, we find them all over the province so they are good diversions when traveling. We've visited three new campgrounds this summer and have enjoyed each one. My challenge to you: Pick a free weekend or a few free days, open up the Alberta Parks Reservation website, enter your dates, and pick a campground with availability. Go someplace new. Be willing to travel to a new part of our province. Go explore.... - and you might just discover a new favourite campground or that next hidden gem. And because you might need this : 5 Tips for Getting a Campsite without a Reservation. We have a huge playground list on the fridge and we love checking them off as we travel around the city. What can you do this month in your city that's new to you?? Plan a day trip to the mountains, book a motel room and head north to Edmonton for a couple of days, or drive into BC to check out the activities and sights in one of the nearby mountain towns. The Discovery Canyon Water Park has been on our list to visit for years now, but it didn't help that it was closed last summer for renovations. We finally visited the park in June (the day it opened for the season) and think it would be a great place to visit on a hot summer day. Even as a day trip, pack the kids up early, drive the hour and a half, spend a few hours tubing down the creek there, and come home. It's a great way to spend a day with the kids over summer vacation! And if you're in the area, we also visited the Town of Blackfalds Aquatic Centre in May - and had a BLAST on the outdoor waterslides. 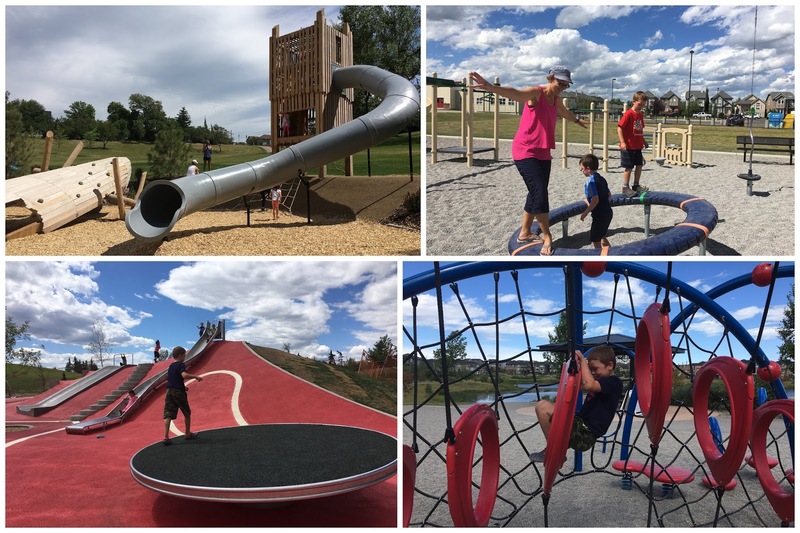 Finally, there's a new aqua park in nearby Sylvan Lake as well that is BIG on our family fun list if we get up to Red Deer again this summer. Looking for a spot to camp nearby: I recommend Jarvis Bay Provincial Park which is located just outside of Red Deer, and very close to Sylvan Lake. If you've seen my newest blog post, you'll know why we recently took a road trip to Edmonton. A NEW Aerial Park! The first of its kind in Canada, and one in three in all of North America. Check out my newest story for all information: Family Review of Edmonton's Snow Valley Aerial Park. And there is a campground right beside the aerial park if you want cheap accommodations nearby. I recently took an overnight trip to Golden with a girlfriend to try out the via ferrata guided climbing route at Kicking Horse Mountain Resort. You can read all about our adventure on the Via Ferrata here. For families though, I still recommend taking a road trip to Golden for some lift-accessed hiking or biking at Kicking Horse Mountain Resort. Visit Boo the bear in the Grizzly Bear Refuge as well while you're there. You can read all about summer at Kicking Horse Mountain Resort here. 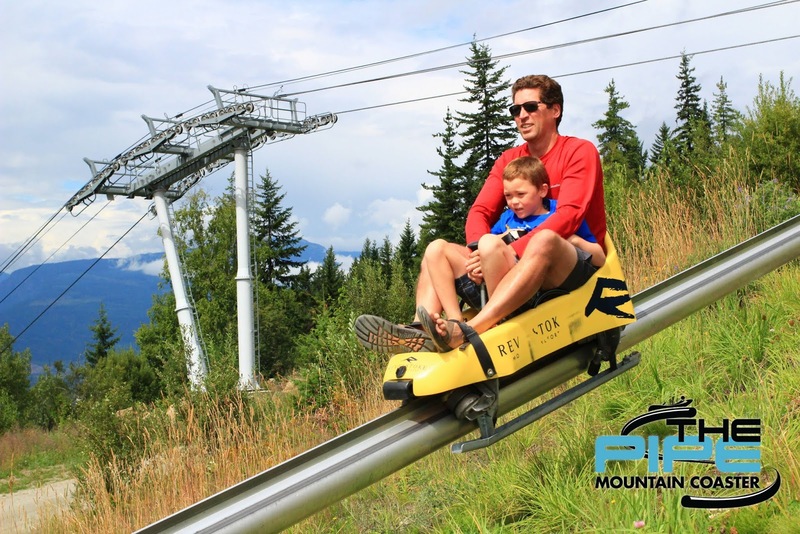 We are going to Revelstoke in the next couple of days for one big reason: We want to ride the Pipe Mountain Coaster at Revelstoke Mountain Resort again. We had so much fun last year, we added it back on to our "summer fun list" again. While at the resort, we're also excited to enjoy some lift accessed sightseeing and hiking, new for the 2017 season. I'll have a full review coming mid-August. Visit the Revelstoke Mountain Resort's website for a full list of summer activities at the resort.